Apogee, the company responsible for such stellar audio hardware products as the Jam ( ) iOS guitar interface, One ( ) USB audio interface and microphone, and GiO ( ) guitar footswitch controller has released the $249 Mic, a diminutive microphone that’s compatible with both computers and iOS devices. While both portable and flexible, Mic’s trade-off is sound that’s good for many, but not all, portable recording situations. 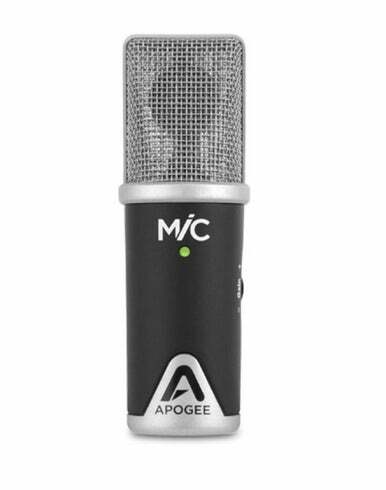 As with every Apogee product I’ve used, Mic is solidly built and attractive. Mic supports 24-bit, 44.1/48 kHz audio and can easily fit in a pants pocket. On the right side of this condensor microphone you find a Gain wheel that allows you to adjust input volume. Near the middle of the mic you find an LED status light, which indicates when MiC is connected but not ready (blue), connected and ready to go (green), and when the input level is too high (red). Included in the box are a .5 meter dock connector cable for connecting Mic to your iOS device (supported devices are iPhone 4S, iPhone 4, and the original iPad and iPad 2), a 1 meter (40-inch) USB cable, and a small desktop tripod. I would have liked to see a standard microphone stand adapter included as well, as the desktop stand isn’t useful in most recording situations—it's too low for voice recording and you'll need a boom stand for recording most other instruments. If you want that adapter you can purchase it separately for $10 or you can wait for the $249 Mic Pro Kit (available soon), which contains not only the Mic, but the adapter, a Mic carrying case, and two 3 meter connector cables (a USB cable and one for connecting to iOS devices). As for its recording quality, it can be quite good for capturing acoustic instruments if you’re careful about its placement. I used it to record my grand piano and found that if I placed it in the middle of the piano’s collapsed music rack and opened the piano’s lid, it recorded a good overall sound—not as good as using two microphones suspended over the strings as you’d do in a more professional setting, but that’s not an option with an iPhone or iPad's microphone. Where I found Mic lacking was with voice—specifically a speaking voice. It produces very clean results, but it lacks bottom end. Try as I might, I just couldn’t get a baritone-FM-DJ timbre out of this microphone. When I moved within a few inches of the mic’s capsule the mic rumbled, even with the gain turned down, and plosives because a problem. When I backed off and turned up the gain, the mic’s sound was bright, but didn’t pick up my voice’s more sonorous tones. If you're accustomed to "working" a mic by changing the distance between it and your mouth you'll find it difficult to do with this microphone. Because I use microphones far more often for voice work (podcasts and video narration), this is a quality that I need from a mic. Given that, for portable podcasting I’d pack a larger microphone that worked with my iPad (with or without a USB powered hub) through Apple’s $29 iPad Camera Connection Kit. In the case of the iPhone, which isn't supported by this adapter, you have far fewer choices and Mic may be among the best of them. Apogee's Mic produces far better results than the microphones built into Apple’s iOS devices. And its native support for those devices and ability to also record solid audio on a computer make it a very attractive microphone. For general purpose voice and instrument recording it’s well worth your consideration, particularly if you’d like to enhance the portable recording studio that is your iPhone 4, iPhone 4S, or iPad. Podcasters looking for a deep and rich sound, however, may find Mic lacking.